Info Wyandotte – Page 4707 – Welcome to Wyandotte Daily! Edwardsville United Methodist Church, 302 N. 4th, Edwardsville, Kan., is planning a church-wide potluck lunch and ministry fair Oct. 19 to discuss church business and ministries. A Community Blood Center blood drive is scheduled from 3 to 7 p.m. Oct. 20 at Parkway Baptist Church classrooms, 12320 Parallel Parkway, Kansas City, Kan. For information or to schedule an appointment, visit www.esavealifenow.org or call 816-753-4040. The Kansas City Kansas Community College Vocal Music Department is inviting the community out to support the college’s choirs during the upcoming GEMS concert. The concert is at 3 p.m. Oct. 12 at St. Patrick Church, 1086 N. 94th St. in Kansas City, Kan. It is free and open to the public. The concert will feature the Community Choir and the Chamber Chair as they perform works by Handel, Rutter, Mealor, Whitacre, Hogan and more. GEMS is a showcase of choral music (both well-known and unknown) from different countries and cultures. These countries include England, Russia, Germany and the United States. John Stafford, choral director and professor at KCKCC, said the music performed at the concert are or will eventually become staples of the choral repertoire. For more information on the choral program at KCKCC, contact John Stafford at jstafford@kckcc.edu or call 913-288-7137. Persons of all Christian traditions are invited to participate in Taizé prayer at 7 p.m. Thursday, Nov. 6,. in Annunciation Chapel on the campus of the Mother House of the Sisters of Charity of Leavenworth, 4200 S. 4th St., Leavenworth, Kan. Taizé prayer is a meditative, candlelit service that includes simple chants sung repeatedly, silence, and prayers of praise and intercession. These prayer services emerged from an ecumenical community of monks in Taizé, France. For more information, visit www.marillaccenter.org or call 913-680-2342. Fall Christian education classes will begin Sunday, Oct. 12, at St. Paul’s Episcopal Church, 1300 N. 18th St. Church school classes for children ages 3 through the sixth grade will start at about 10:30 a.m. Confirmation classes for those in the sixth grade and older will start at 11:30 a.m.; lunch will be served. A Community Blood Center blood drive is scheduled from 2:30 p.m. to 6:30 p.m. Oct. 21 at Wyandotte United Methodist Church fellowship hall, 7901 Oakland, Kansas City, Kan. For information or to schedule an appointment, visit www.esavealifenow.org or call 816-753-4040. 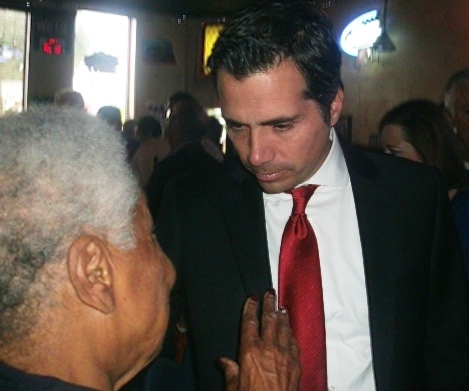 Greg Orman, independent candidate for U.S. Senate, was at Breit’s Friday on North 5th Street in Kansas City, Kan., to meet voters. 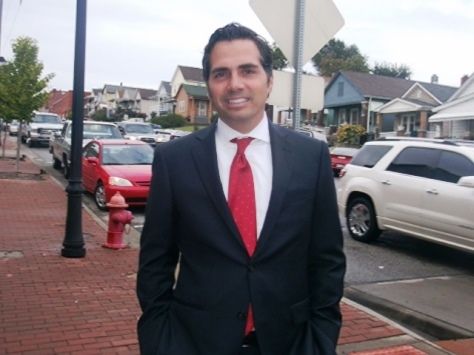 An estimated 150 people met Orman, an independent candidate who faces Republican incumbent Sen. Pat Roberts in the general election. The crowd was larger than had been anticipated. The Kansas City Renaissance Festival continues on Saturday and Sunday at the festival grounds at 628 N. 126th St. (126th and State), Bonner Springs. The festival is the re-creation of a 16th century English village. Music, food, crafts, shows and other entertainment are featured at the festival, which runs on weekends through Oct. 14. Hours are 10 a.m. to 7 p.m. For more information, visit the website at www.kcrenfest.com. The Kansas City Metro Walk to Cure Lupus is scheduled Saturday, Oct. 11, at CommunityAmerica Ballpark at The Legends area in Kansas City, Kan. Former Kansas City Chiefs player Eddie Kennison, honorary co-chair, will lead the walk. For more information, see www.lupuswalkkc.org. Turner Days are scheduled Oct. 11-12. The event includes a parade, vendors, food, entertainment, car show and petting zoo. For more information, see http://wyandottedaily.com/turner-days-celebrates-30-years-this-weekend/. Beer, Bikes and Barbecue: A Benefit for FreeWheels for Kids, will be held from 2 p.m. to 9 p.m. Saturday, Oct. 11, in Kansas City, Kan. After a day of charity bike rides, touring the historic churches, there will be an evening of beer and barbecue. For more information, visit the website, freewheelsbbb.eventbrite.com. Grinter Place state historic site will hold an evening of family friendly entertainment from 6 to 8 p.m. Saturday, Oct. 11, with “Storytelling around the Campfire.” Visitors can hear Old West stories and American Indian folklore around the campfire. The Grinter house will be open for tours, with tours beginning on the hour and half hour. Roasted hot dogs and s’mores will be provided. Admission is free. Donations are welcome. Grinter Place is located at 1420 S. 78th St., Kansas City, Kan. For more information, call 913-299-0373 or visit kshs.org/grinter_place. The Kansas City Kansas Community College Vocal Music Department is inviting the community to support the college’s choirs during the upcoming GEMS concert. The concert is at 5 p.m. Oct. 12 at St. Patrick Church, 1086 N. 94th St. in Kansas City, Kan. It is free and open to the public. The National Alliance on Mental Illness, Kansas City, Kan., Support and Education Group will meet Monday, Oct. 13, at Trinity Community Church, 5010 Parallel Parkway, Kansas City, Kan. The business meeting will be at 7 p.m. and the program will be from 7:30 to 9 p.m. Laurel Reynolds, nurse practitioner at Wyandotte Center, will speak on “Importance of Therapy and Medication.” The group is for consumers and families. For more information, call 913-299-8490. The Leavenworth Road Association will meet at 6 p.m. Oct. 14 at Trinity Community Church, 5010 Parallel Parkway, lower level, for a potluck dinner and social hour followed by the program at 7 p.m. There will be flu shots available at the meeting, plus a presentation about hearing tests. The board of directors of the Kansas City, Kan., Board of Public Utilities will meet on Tuesday, Oct. 14, instead of Oct. 15. The work session will begin at 3:30 p.m. Oct. 14 and the strategic plan will be discussed. The regular meeting will begin at 6 p.m. at the BPU Administration Building at 540 Minnesota Ave, Kansas City, Kan., and is open to the public. A Community Blood Center blood drive is scheduled from 8 a.m. to 3:30 p.m. Wednesday, Oct. 15, at Kansas City Kansas Community College Technical Education Center – Multipurpose Room, 6565 State Ave., Kansas City, Kan. Another blood drive will be held from 8:30 a.m. to 3:30 p.m. Wednesday, Oct. 15, at Kansas City Kansas Community College, Room 2325, Jewell Center, 7250 State Ave. For information or to schedule an appointment, visit www.esavealifenow.org or call 816-753-4040. “Budgeting for the Holidays,” will be held Wednesday, Oct. 15. A light supper will be served at 5:30 p.m. and the program will be from 6 to 7:30 p.m., at Keeler Women’s Center, 2220 Central Ave., Kansas City, Kan. Men and women are welcome. The program is presented in partnership with Heartland Habitat for Humanity. Call 913-906-8990 to register. Keeler Women’s Center, in partnership with Project Rachel, will present “What I Learned After My Abortion,” from 6:30 to 7:30 p.m. Wednesday evening, Oct. 15, at 2220 Central Ave., Kansas City, Kan. Call 913-906-8990 to register. Call 913-906-8990 to register or call Project Rachel at 816-591-3804. “Perennials for a Lasting Garden,” a presentation by Sarah Heppler, master gardener with K-State Research and Extension, will be offered from 9:30 a.m. to 11 a.m. Thursday, Oct. 16, at Keeler Women’s Center, 2220 Central Ave., Kansas City, Kan. Call 913-906-8990 to register. A memory retention class, “Master of Memory,” will be held from 1 to 3 p.m. Thursday, Oct. 16, at the K-State Extension Office, 1216 N. 79th St., Kansas City, Kan. “Medications and Memory Function” is the topic for Oct. 16. For more information and to register for the class, call 913-299-9300 or email lwuellne@ksu.edu. The Unified Government Commission will meet at 7 p.m. Oct. 16 at City Hall, lobby level, 701 N. 7th St., Kansas City, Kan. An agenda should be posted at www.wycokck.org. “Babes in Arms,” a musical by Rodgers and Hart, will be presented at 7:30 p.m. Oct. 16, 17 and 18 at the Kansas City Kansas Community College Performing Arts Center, 7250 State Ave., Kansas City, Kan. There is also a matinee performance at 2:30 p.m. Oct. 19. Students in the KCKCC Theatre Department will present the play. Tickets are $5 for students, KCKCC staff, faculty and senior citizens; and $10 for adults. For more information or to make reservations, call 913-288-7106. A Leavenworth Road Association fundraiser is planned from 6 to 10:30 p.m. Oct. 17 at the FOP Hall, 7844 Leavenworth Road. The chili dinner and dance will feature music by the Hole in the Wall Band from the Frontier Steakhouse, playing from 8 p.m. to 10:30 p.m. Advance tickets are $12 per person or $20 per couple. At the door, tickets are $15 per person or $25 per couple. For ticket information, call the Leavenworth Road Association office at 913-788-3988. The Eighth Street YMCA plans a Trunk and Treat event from 5:30 to 8 p.m. Friday, Oct. 24, at 900 N. 8th St., Kansas City, Kan. Activities will include a carnival, games, costume parade and a trunk and treat. It is free and open to the public. Argentine Community Center, 2810 Metropolitan; Armourdale Community Center, 730 Osage; Bethany Community Center, 1120 Central Ave.; Kensington Gym, 2900 State Ave.; Piper Community Center, 3130 N. 122nd St.